The newly opened SPA center of Hotel Zdravets Wellness & SPA invites you to a SPA fiesta. Upon entering you will feel the atmosphere of relaxation and comfort that predispose you to relax and enjoy the experienced hands of our masseurs. Aromatherapy and a special peel with honey and coffee will make you feel in the far east, mud therapy with mud from Jordan, chocolate and wine therapy for face and body, treatment programs, massage, aroma and pearl bath, sauna, steam bath with lemon and mint, relax room with soft music, and many procedures that have one goal: Relax and Health. 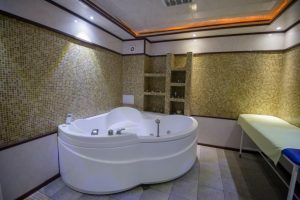 Sauna is a hot and moist room with wooden lining. It is heated up to about 100 degrees. Preheating is done by specialized electric or wooden stoves, with volcanic stones inside them. Heat and moist is stored and distributed thanks to these exact stones, these stones also have a very specific aroma. 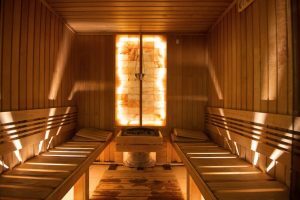 Dry and hot air within the sauna has a regenerative and strengthening effect over human organism, which is mainly achieved by stimulating the release of toxins. Sauna is an ideal remedy against everyday stress and overweight. The effect of the sauna is always positive for the entire body. Turkish bath is a spacious room for steaming furnished with benches, beautiful design, soft dim lights, and dome-shaped ceiling. The floor and benches are heated. The temperature there is about 40-50°С that makes Turkish bath good for people that cannot tolerate too high temperatures. The effect of Turkish bath over the entire body is above all relaxing. The major effect of Turkish bath is soothing of the nervous system. Turkish bath effectively cleanses skin, stimulates skin regeneration and metabolism, and slows the skin aging process. Turkish bath has gentle, careful and deep warming effect over muscles and joints. 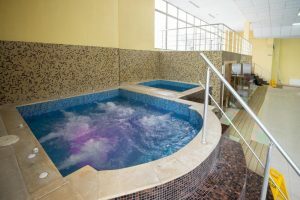 In this way having Turkish bath helps you relax and experience a strong positive effect when recovering from an injury. 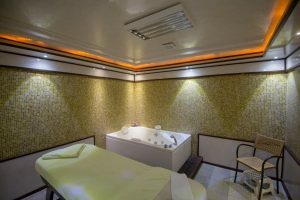 Turkish bath is the most gentle of all kinds of baths; however it should be avoided by people suffering from cardiovascular diseases and inflammation of internal organs. Water treatment and therapy facilities – All water treatment procedures are quite pleasant. 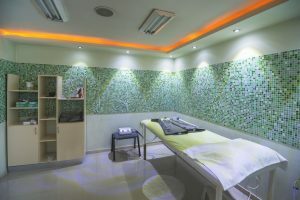 Their effect is due to water temperature, as well as to the swift change of that temperature (thermal effect), water stream, lifting power pressure of water (mechanical effect), chemical composition (chemical effect), as well as due to water Underwater massage and procedures yield versatile results. Their reflective effect is particularly pronounced, as it creates a pleasant feeling of physical and mental relaxation and a general improvement of the mood. Changes in body temperature as a result of the effect of warmer or cooler water have an impact over the entire nervous system. Brief water procedures – hot or cold, are excitatory, prolonged water procedures usually lead to relaxation of the nervous system. Water massage and procedures increase overall resistance to fatigue and significant temperature fluctuations. Active substances are released into the skin and body, which can lead to increased non-specific hardening that is too valuable. It also increases blood circulation of tissues and accelerates lymph circulation, which results in faster elimination of waste matter from the muscles and joints after physical efforts. Underwater massage and procedures are mostly used to help one relax, at general weakness, mood fluctuations, as well as at lack of appetite, predisposition to recurrent infectious diseases, etc. 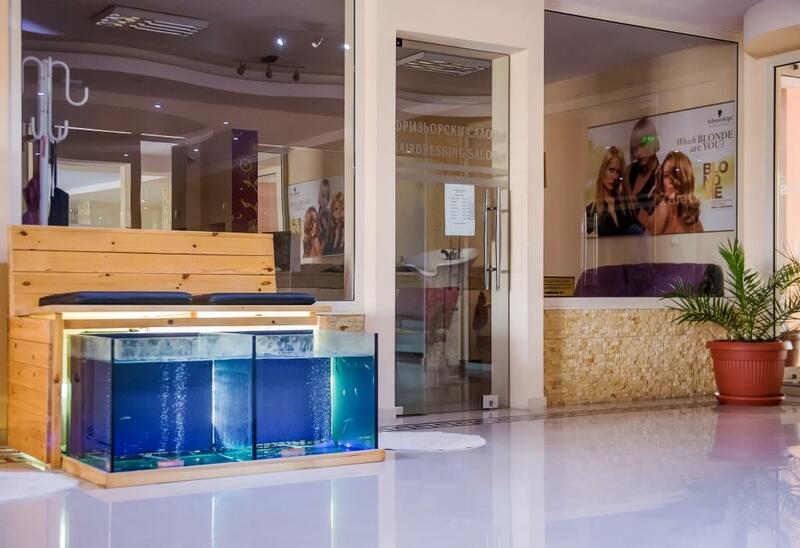 The result of underwater massage could be enhanced by adding different substances to water – salt, foam substances that are sold. Steam bath is a hot room with temperature of 40-50°С and high humidity. Through a steam generator steam is sprayed into the room. The ceiling of a classic steam bath is an “arc” type so that condensed steam could flow down the walls instead of leaking from the ceiling. 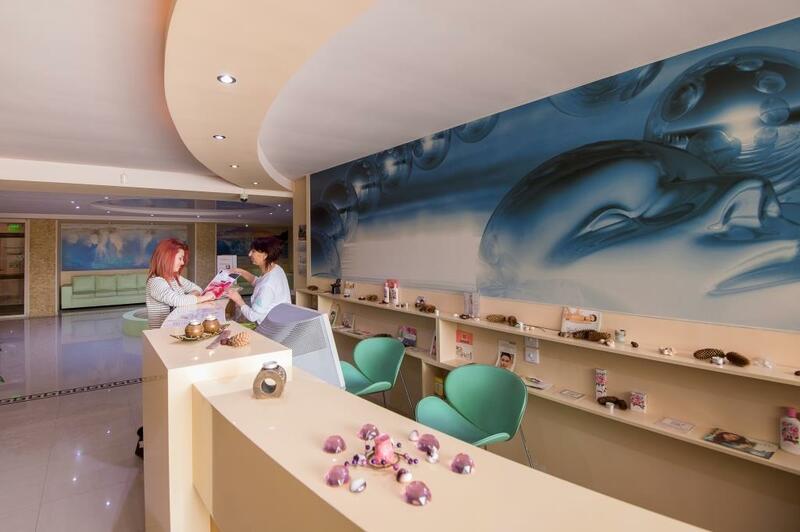 There are comfortable benches for seating as well as anatomic benches with lining made of glass ceramics, stone mosaic, etc. Despite of the high air humidity, it is easy to breathe at a steam bath because the steam is not dry and does not burn the respiratory tract. The time spent in the steam bath strengthens the immune system, improves metabolism and muscle plasticity. The pores are opened and cleaned, the body feels restful. Various scents or salts can be injected into the steam bath, which are suitable for the lungs and respiratory tract. Steam bath alleviates arthritis, rheumatism, joint pain, muscle pain and tension symptoms. Excessive sweating is the ideal way for keeping your skin healthy; it cleans up better than soap and water. Steam bath stimulates the blood flow to the skin, opens the pores. Washes away dead skin cells and toxins. Steam bath should be avoided by pregnant women and people suffering from cardiovascular diseases. Whirlpool bath – This bath combines the beneficial effects of water jets directed towards the whole body reflective zones, with the healthy effect of water rich in The toning effect is guaranteed.